﻿﻿ Last week was a crazy week, trying to recuperate from my Key Largo trip. I had to get ready for Glitterfest, which is a really big deal here on the west coast. Gf was super busy, I think their best show yet with many new, amazingly talented vendors. I could have spent a lot of money there but thankfully I was too busy to get out from behind my booth! Sunday was a day of total relaxation after unpacking all my goodies. I have been wanting to get back into my Key Largo projects but just wouldn't even let myself look at them because I had to be ready for GF. So yesterday, out came all the charms and vintage images that I gathered from our charm day in KL. I couldn't rip open that printer tray fast enough! I wanted it to really capture my trip to Florida, using the turquoise of the sea as my base color. Mermaids (and babies), seashells and of course keys found their way into all my little compartments. 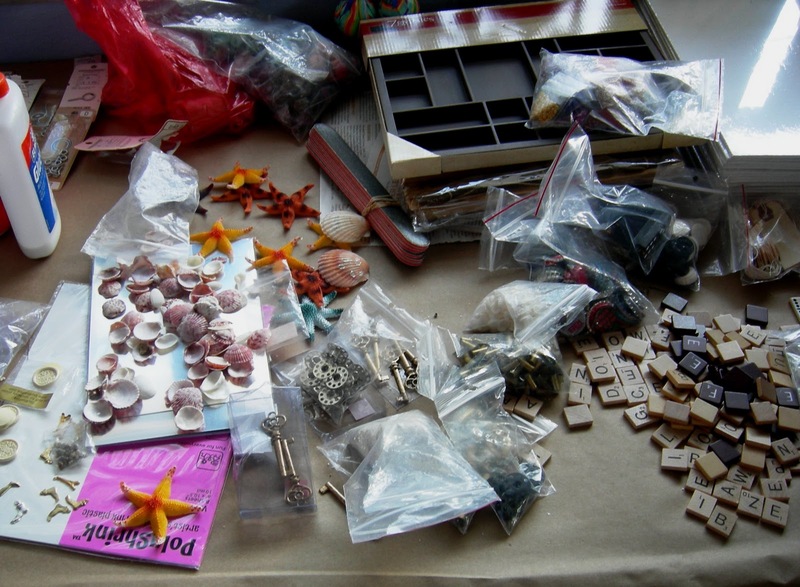 On my last day in KL, I learned how to make charms out of bottle caps, dominoes, memory frames and other assorted stuff, thank you very much Val and Eileen! 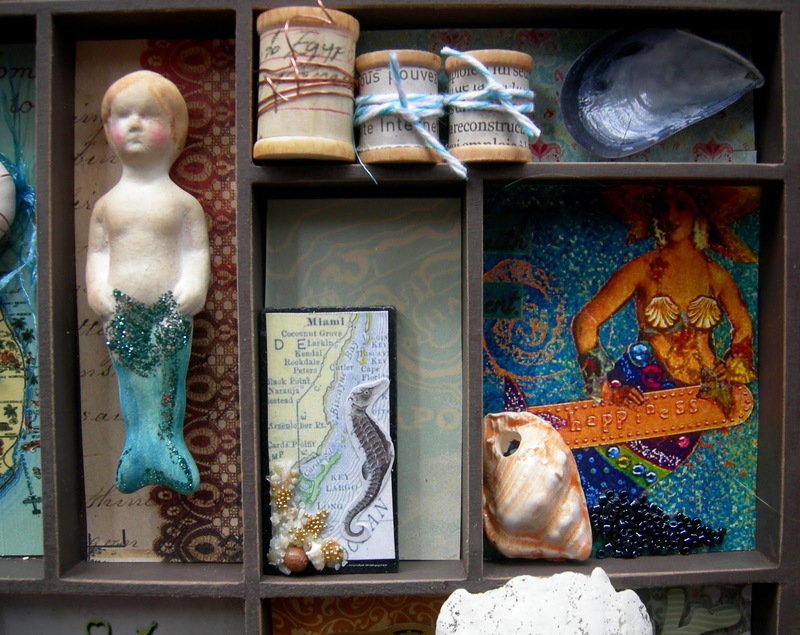 All of my tiny treasured pieces are tucked into the little boxes. One of Jen's handpainted faces found her way into a box as did Ingrid Dijkers bisque merbaby. There's a glittered heart with the word dream on it that I put to the left side of the tray that I picked up from a vendor at CHA. The colors went perfectly as did the word dream, as I dream of another fabulous artsy, beachy retreat in the future! This is Cool! I have been wanting to make one of these! Julie, You had my full attention with the first photo where I spied seashells with sea stars ! 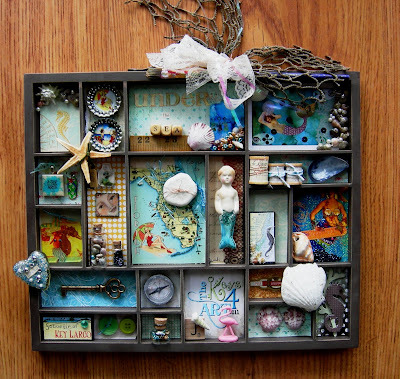 Oh what fun, small sea shore treasures gathered together in this wonderful vintage tray. 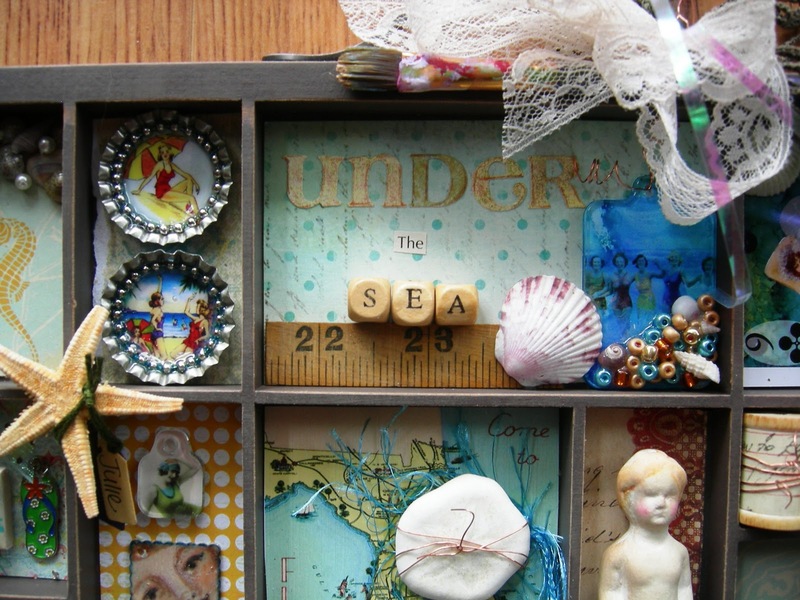 You know you have me I'm inspired and excited about creating this and more seaside beauties at our next fabulous artsy, beachy retreat ! This is really beautiful. What a wonderful collage! I love every little piece of this! There's so much to see. Thanks for sharing! Oops! Sorry, that link was a mistake! Oh well...Myrna IS having a great contest today so I guess all's well. I LOVE, LOVE, LOVE the way your printers tray turned out. Such wonderful use of all the charms and images that were brought and shared.